Por qu yo? Versos Positivos Cuando hay P rdida y Tristeza gu a para ni os peque os y grandes en circunstancias de la vida que a veces son catastr ficas. Why Me? Positive Verse for Loss and Sadness guides young and old readers through life's sometimes catastrophic events. Hardback, Spanish and English Combination ed. Spanish and English Combination ed. Por qu yo? Versos Positivos Cuando hay P rdida y Tristeza gu a para ni os peque os y grandes en circunstancias de la vida que a veces son catastr ficas. Por qu yo? Se ha dise ado para llevar palabras de aliento a aquellos que han sido afectados por situaciones que les ha cambiado la vida como la muerte, la p rdida de una mascota, el cambio en la estructura familiar o uno de tantos retos y decepciones. Why Me? Positive Verse for Loss and Sadness eloquently guides both young and old readers through life's sometimes catastrophic events. 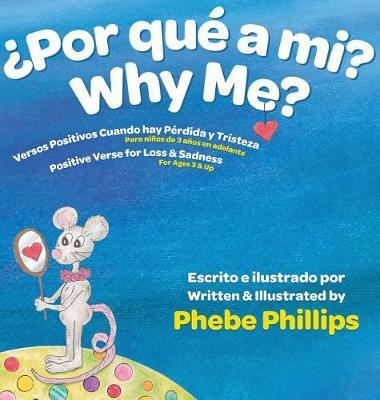 Using poetic free verse, Phebe Phillips leads her readers into an awareness that each of us is special and that indeed, each of us is loved. Why Me? is designed to bring words of comfort to those affected by life-changing events from the cataclysmic such as a death, to the heart-breaking loss of a pet, or to a change in the family structure such as a divorce or another of life's many challenges or disappointments. Beautifully illustrated in chalk pastels, Phebe frees each reader to use their own imagination as she weaves her story to include diverse portrayals of ethnicity and gender while using animals in human form. This story was originally created at the suggestion of the Dallas Chapter of the American Red Cross to address positively the hard subjects of loss and sadness. Since its beginning 4000 copies have been placed in the ARC's Emergency Response Vehicles for distribution to those in need of comforting words. Why Me? is appropriate for all ages.